While at the Cleveland Institute of Art, she attracted the attention of Roger Welchans, who helped Newman get her first show at John Carroll University. 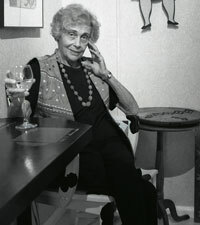 Throughout her life her work has been exhibited in a variety of places around Ohio, Illinois, Maryland, and New York. Her work was exhibited in Oberlin in an exhibition entitled, “Drawings” and her collections are all over the United States. Newspapers, vacations, street scenes, and her own life experiences have inspired Newman’s artwork, which include, but are not limited to, layered reliefs, small sculptures, and paintings.